Bite-Sized: Fishing Village | Wake up, Meeples! Fishing Village is a very strong card, strong enough to enable decks that wouldn’t work with most other villages, in spite of the fact that it doesn’t draw a card. Most of the time drawing a card is better than getting the $1, except for in the very beginning of the game, making Fishing Village one of the few villages it can be OK to open with. To compensate for the fact that Fishing Village doesn’t draw a card, it’s usually best when paired with stronger sources of draw; +3 cards or more. Most villages give you +2 Actions when you play them, and while it’s true that one play of Fishing Village will net you 3 Actions, the more relevant comparison is that it gives you the “village effect” on two consecutive turns. The important thing here is that it doesn’t actually increase the number of terminal actions you can play in one turn, but rather you only have to draw the card one time to get the benefit for two turns. 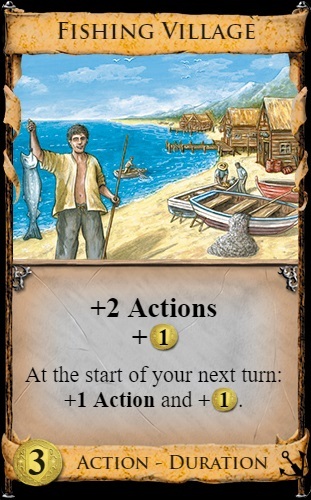 The reason Fishing Village is so powerful is that duration-Fishing-Villages give you actions at the start of your turn, which is by far the best time to get actions. You don’t need to worry about drawing villages to kick off your turn as long as you have some in play. For this reason, in many decks it can be good to “stagger” your Fishing Villages, meaning that you want to have roughly the same number of duration-Fishing-Villages out at the start of each of your turns, instead of having a bunch on one turn and then only one or two on the next. Decks constructed and played this way are usually very reliable when other engine decks could have issues.